International Buyers - Please Note: Import duties, taxes, and charges are not included in the item price or shipping cost. These charges are the buyer`s responsibility. Please check with your country`s customs office to determine what these additional costs will be prior to bidding or buying. 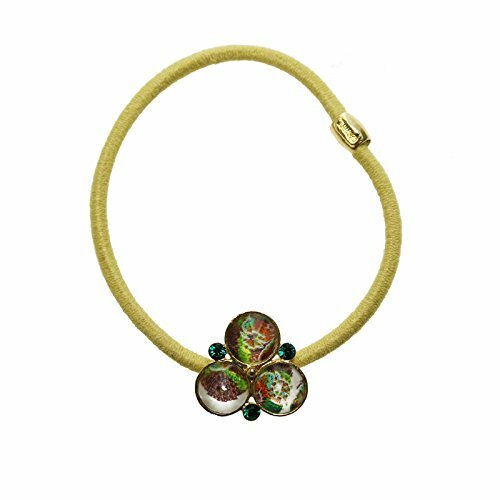 It is a ponytail holder using resin parts of "Pansy Series (Green)". It is a cute design that looks like a tasty yellow rubber tied with a clean ribbon. Even a small glow that emerald colored rhinestones shine brightly will shine on your hair. The pattern which cut out a part of the petal of the pansy randomly can also look like a goblin weave. Casually pleasing accent of unique up do. It is a very popular accessory for gifts. Because the metal part is nickel free, it is also recommended for those who are allergic to metal.